As the name suggests, the idea is come up with a nail art that mimics the usual white and blue porcelain. I painted each nail to look like porcelain instead of just having an accent nail as how I did the first one. In this version, I painted flowers, hearts, and added a few random dots to fill in awkward spaces. The technique is quite easy. 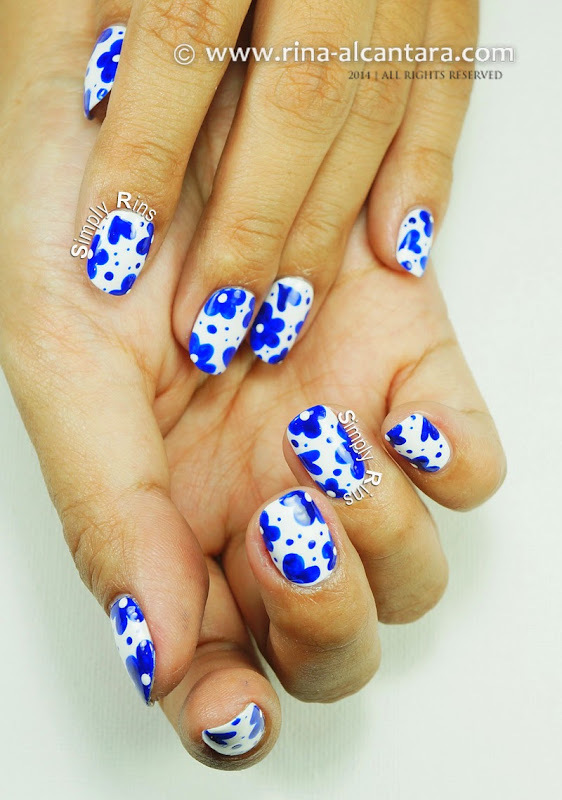 You can choose any pattern you like to create this look for as long as you use a royal blue acrylic paint and polish your nails white. I thought that an aztec pattern would probably look great as well. But I was in a dainty mood so I opted for a floral look. I also aimed for a "washed out" effect so I slightly watered down my blue acrylic paint so that the result would be that when I paint the design, opacity will not be even. You'll notice this in the video tutorial included in this post. I think it made the entire design more interesting to look at. This is a fun mani to wear. I actually received a few compliments from strangers during the days that I wore this. It looks elegant and this might sound crazy, but it gave me that feeling that my nails are fragile. I hope you enjoyed watching the tutorial. But most importantly, I hope you were inspired. Is this nail design a thumbs up? Let me know by leaving a comment.